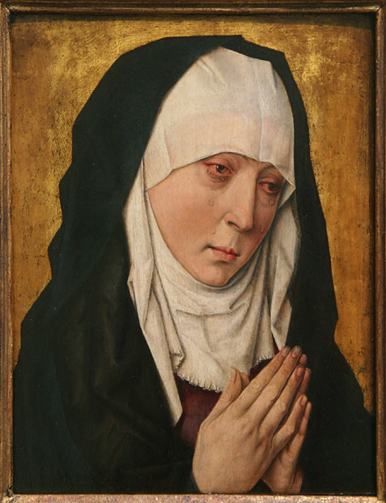 Anne Harris reflects on the painting Mater Dolorosa from the Workshop of Dieric Bouts, c. 1410–1475. Harris writes: "Let’s talk tension. Contradiction. The stress created when opposites push and pull. This painting is compressed, squeezed between its scuffed gold backdrop and the picture plane, pressurized. She swells forward but is embedded in her background, held firm by linear precision and an allegiance to shape in its battle against volume. The rhythmic outer edge of her black robe is a perfect yin/yang figure/ground demo. Within the black, if we wait for it, we find color–dark light–a sense of suspended deep luminosity, like staring through night, through dark air, like falling into an Ad Reinhardt... Eventually our eyes find the interior edge of the robe, a long curved zigzag that describes the entirety of Mary. Following this leads us in and out of folds, between cracks, over and around the volume of her head, to tuck behind Mary’s hidden left ear, then down to slide between her fingers, curve around her left wrist, skip a beat, then start over–a profoundly complicated path that works so well we think it’s simple."